The Tubbs Fire was one of the most devastating fires in California’s history. It started on October 8, 2017, northwest of Calistoga, and burned for 23 consecutive days until it was extinguished on October 31. Loss of Life and Property. Tragically, the Tubbs Fire caused the death of at least 22 persons. The Walkup Melodia fire team is privileged to represent a number of these families. The fire also displaced hundreds of families and individuals from their homes. The fire destroyed residences, businesses, barns, crops and other property in the following zip codes: 95403, 95404, 94515, 95409 and 95448. In all, the Tubbs Fire burned 5,643 structures and over 36,000 acres in Napa and Sonoma counties. The total structures lost is the most of any known fire in California. Of the 36,000 acres burned, over 30,000 acres are owned by private citizens. The extent of destruction to the homes of individuals and families can be seen at this map generated by CAL FIRE. http://calfire-forestry.maps.arcgis.com/apps/PublicInformation/index.html?appid=5bbcbed430ad45e5a38e6be155ef5fec. 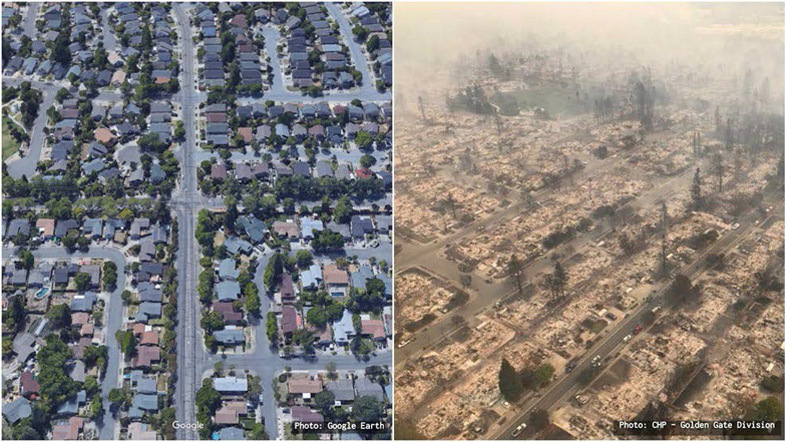 Additionally, the photo below shows a neighborhood in Santa Rosa before and after the Tubbs Fire. Fig. 1 Santa Rosa Before and After the Tubbs Fire, one of the North Bay Fires. Origin. 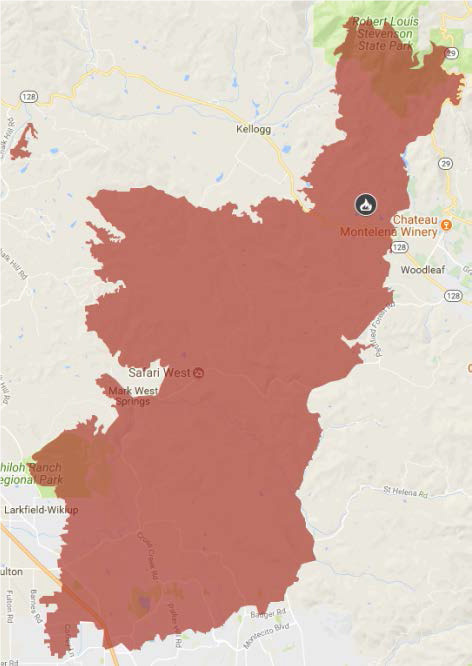 The origin point for the Tubbs Fire is in the general area of Highway 128 and Bennett Lane, roughly one mile from Highway 128’s intersection with Tubbs Lane in Calistoga. The following figure shows the perimeter of the fire and its vast scope. Fig. 3. Map of Tubbs Fire. Rebuilding the Community. The repair and reconstruction of homes and businesses in the community has begun but will be challenging. Most homeowners are underinsured without sufficient coverage to replace and restore the homes they lost to pre-fire conditions. The Tubbs Fire has also produced an increased risk of flooding, erosion and landslides according to WERT. Homeowners should communicate with a qualified professional to assess flood hazards and evaluate how the fire has affected their property, particularly whether any runoff from the hillslope exists that may present a life-safety hazard, whether soil is erodible and whether large rocks, boulders or other materials near their homes pose a threat. PG&E and the Cause of the Fire. 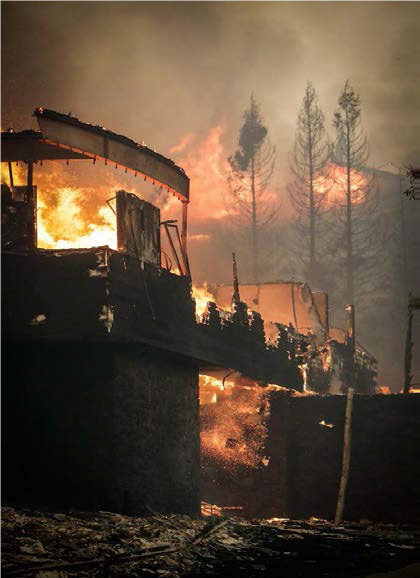 PG&E is currently under investigation by the California Public Utilities Commission for their involvement in the origination of this tragic blaze. CPUC has demanded that PG&E preserve all equipment related to this fire as well as internal communications discussing the disaster. The Walkup Melodia fire team is working with highly qualified privately retained cause and origin experts. Our analysis to date supports the filing of damage actions on behalf of our clients against the utility . On the evening of October 8, electrical lines owned and maintained by PG&E fell , came into contact with vegetation and ignited a fire. The photo below shows flames and downed power poles on Parker Hill Road. Approximately two weeks after the start of the Tubbs fire, PG&E informed the CPUC that there was an incident involving damage to its equipment on October 8, 2017 at 9:45 p.m. at 1128 Bennett Lane. (PG&E Incident Report No. 171026-8601) This is the same area that CAL FIRE identifies as the location of the Tubbs fire. (CAL FIRE Tubbs Incident Information). The investigation of PG&E’s practices, inspections and oversight continues to be the subject of investigation by the Public Utilities Commission and this office.